In the Blackfeet tribe was an association known as the All Comrades. This was made up of a dozen secret societies graded according to age, the members of the younger societies passing, after a few years, into the older ones. This association was in part benevolent and helpful and in part to encourage bravery in war, but its main purpose was to see that the orders of the chiefs were carried out, and to punish offences against the tribe at large. There are stories which explain how these societies came to be instituted, and this one tells how the Society of Bulls began. It was long, long ago, very far back, that this happened. In those days the people used to kill the buffalo by driving them over a steep place near the river, down which they fell into a great pen built at the foot of the cliff, where the buffalo that had not been killed by the fall were shot with arrows by the men. Then the people went into the pen and skinned the buffalo and cut them up and carried the meat away to their camp. This pen they called piskun. In those days the people had built a great piskun with high, strong walls. No buffalo could jump over it; not even if a great crowd of them ran against it, could they push it down. The young men kept going out, as they always did, to try to bring the buffalo to the edge of the cliff, but somehow they would not jump over into the piskun. When they had come almost to the edge, they would turn off to one side or the other and run down the sloping hills and away over the prairie. So the people could get no food, and they began to be hungry, and at last to starve. Early one morning a young woman, the daughter of a brave man, was going from her lodge down to the stream to get water, and as she went along she saw a herd of buffalo feeding on the prairie, close to the edge of the cliff above the great piskun. "Oh," she called out, "if you will only jump off into the piskun I will marry one of you." She did not mean this, but said it just in fun, and as soon as she had said it, she wondered greatly when she saw the buffalo come jumping over the edge, falling down the cliff. A moment later a big bull jumped high over the wall of the piskun and came toward her, and now truly she was frightened. "Come," he said, taking hold of her arm. "No, no," she answered, trying to pull herself away. "But you said if the buffalo would only jump over, you would marry one of them. Look, the piskun is full." She did not answer, and without saying any-thing more he led her up over the bluff and out on the prairie. After the people had finished killing the buffalo and cutting up the meat, they missed this young woman. No one knew where she had gone, and her relations were frightened and very sad because they could not find her. So her father took his bow and quiver and put them on his back and said, "I will go and find her"; and he climbed the bluff and set out over the prairie. He travelled some distance, but saw nothing of his daughter. The sun was hot, and at length he came to a buffalo wallow in which some water was standing, and drank and sat down to rest. A little way off on the prairie he saw a herd of buffalo. As the man sat there by the wallow, trying to think what he might do to find his daughter, a magpie came up and alighted on the ground near him. The man spoke to it, saying, "Mam-i-at'si-kimi�Magpie�you are a beautiful bird; help me, for I am very unhappy. As you travel about over the prairie, look everywhere, and if you see my daughter say to her, 'Your father is waiting by the wallow.'" Soon the magpie flew away, and as he passed near the herd of buffalo he saw the young woman there, and alighting on the ground near her, he began to pick at things, turning his head this way and that, and seeming to look for food. When he was close to the girl he said to her, "Your father is waiting by the wallow." "Sh-h-h! Sh-h-h!" replied the girl in a whisper, looking about her very much frightened, for her bull husband was sleeping close by. "Do not speak so loud. Go back and tell him to wait." "Your daughter is over there with the buffalo. She says 'Wait,' said the magpie when he had flown back to the poor father. After a little time the bull awoke and said to his wife, "Go and bring me some water." Then the woman was glad, and she took a horn from her husband's head and went to the wallow for water. "Oh, why did you come?" she said to her father. "They will surely kill you." "I came to take my daughter back to my lodge. Come, let us go." "No," said the girl, "not now. They will surely chase us and kill us. Wait until he sleeps again and I will try to get away." Then she filled the horn with water and went back to the buffalo. Her husband drank a swallow of the water, and when he took the horn it made a noise. "Ah," he said, as he looked about, "a person is somewhere close by." "No one," replied the girl, but her heart stood still. The bull drank again. Then he stood up on his feet and moaned and grunted, "M-m-ah-oo! Bu-u-u!" Fearful was the sound. Up rose the other bulls, raised their tails in the air, tossed their heads and bellowed back to him. Then they pawed the earth, thrust their horns into it, rushed here and there, and presently, coming to the wallow, found there the poor man. They rushed over him, trampling ' him with their great hoofs, thrust their horns into his body and tore him to pieces, and tram-pled him again. Soon not even a piece of his body could be seen�only the wet earth cut up by their hoofs. Then his daughter mourned in sorrow. "Oh! Ah! Ni-nah-ah! Oh! Ah! Ni-nah-ah! "�Ah, my father, my father. "Ah," said her bull husband; "now you understand how it is that we feel. You mourn for your father; but we have seen our fathers, mothers, and many of our relations fall over the high cliffs, to be killed for food by your people. But now I will pity you, I will give you one chance. If you can bring your father to life, you and he may go back to your camp." Then said the woman, "Ah, magpie, pity me, help me; for now I need help. Look in the trampled mud of the wallow and see if you can find even a little piece of my father's body and bring it to me." Swiftly the magpie flew to the wallow, and alighting there, walked all about, looking in every hole and even tearing up the mud with his sharp beak. Presently he uncovered something white, and as he picked the mud from about it, he saw it was a bone, and pulling hard, he dragged it from the mud�the joint of a man's backbone. Then gladly he flew back with it to the woman. The girl put the bone on the ground and covered it with her robe and began to sing. After she had sung she took the robe away, and there under it lay her father's body, as if he had just died. Once again she covered the body with the robe and sang, and this time when she took the robe away the body was breathing: A third time she covered the body with the robe and sang, and when she again took away the robe, the body moved its arms and legs a little. A fourth time she covered it and sang, and when she took away the robe her father stood up. The buffalo were surprised and the magpie was glad, and flew about making a great noise. "Now this day we have seen a strange thing," said her bull husband. "The people's medicine is strong. He whom we trampled to death, whom our hoofs cut to pieces and mixed all up with the soil, is alive again. Now you shall go to your home, but before you go we will teach you our dance and our song. Do not forget them." The buffalo showed the man and his daughter their dance and taught them the songs, and then the bull said to them, "Now you are to go back to your home, but do not forget what you have seen. Teach the people this dance and these songs, and while they are dancing it let them wear a bull's head and a robe. Those who are to be of the Bulls Society shall wear them." When the poor man returned with his daughter, all the people were glad. Then after a time he called a council of the chiefs and told them the things that had happened. The chiefs chose certain young men to be Bulls, and the man taught them the dance and the song, and told them everything that they should do. So began the Bull Society. For a long time the buffalo had not been seen. Every one was hungry, for the hunters could find no food for the people. A certain man, who had two wives, a daughter, and two sons, as he saw what a hard time they were having, said, "I shall not stop here to die. To-morrow we will move toward the mountains, where we may kill elk and deer and sheep and antelope, or, if not these, at least we shall find beaver and birds, and can get them. In this way we shall have food to eat and shall live." Next morning they caught their dogs and harnessed them to the travois and took their loads on their backs and set out. It was still winter, and they travelled slowly. Besides, they were weak from hunger and could go only a short distance in a day. The fourth night came, and they sat in their lodge, tired and hungry. No one spoke, for people who are hungry do not care to talk. Suddenly, outside, the dogs began to bark, and soon the door was pushed aside and a young man entered. "Welcome," said the man, and he motioned to a place where the stranger should sit. Now during this day there had been blowing a warm wind which had melted the snow, so that the prairie was covered with water, yet this young man's moccasins and leggings were dry. They saw this, and were frightened. They sat there for a long time, saying nothing. Then the young man spoke and asked, "Why is this? Why do you not give me food?" "Ah," replied the father, "you see here people who are truly poor. We have no food. For many days the buffalo did not come in sight, and we looked for deer and other animals which people eat, and when these had all been killed we began to starve. Then I said, 'We will not stay here to die from hunger,' and we set out for the mountains. This is the fourth night of our travels." "Ah," said the young man, "then your travels are ended. You need go no farther. Close by here is our piskun. Many buffalo have been run in, and our parfleches are filled with dried meat. Wait a little; I will go and bring you some," and he went out. As soon as he had gone they began to talk about this strange person. They were afraid of him and did not know what to do. The children began to cry, and the women tried to quiet them. Presently the young man came back, bringing some meat. "There is food," said he, as he put it down by the woman. "Now to-morrow move your camp over to our lodges. Do not fear anything. No matter what strange things you may see, do not fear. All will be your friends. Yet about one thing I must warn you. In this you should be careful. If you should find an arrow lying about anywhere, in the piskun or outside, do not touch it, neither you nor your wives nor your children." When he had said this he went out. The father took his pipe and filled it, and smoked and prayed to all the powers, saying, "Hear now, Sun; listen, Above People; listen, Underwater People; now you have taken pity; now you have given us food. We are going to those mysterious ones who walk through water with dry moccasins. Protect us among these to-be-feared people. Let us live. Man, woman, and child, give us long life." Now from the fire again arose the smell of roasting meat. The children ate and played. Those who so long had been silent now talked and laughed. Early in the morning, as soon as the sun had risen, they took down their lodge and packed their dogs and started for the camp of the stranger. When they had come to where they could see it, they found it a wonderful place. There around the piskun, and stretching far up and down the valley, were pitched the lodges of the meat eaters. They could not see them all, but near by they saw the lodges of the Bear band, the Fox band, and the Raven band. The father of the young man who had visited them and given them meat was the, chief of the Wolf band, and by that band they pitched their lodge. Truly that was a happy place. Food was plenty. All day long people were shouting out for feasts, and everywhere was heard the sound of drumming and singing and dancing. The newly come people went to the piskun for meat, and there one of the children saw an arrow lying on the ground. It was a beautiful arrow, the stone point long, slender, and sharp, the shaft round and straight. The boy remembered what had been said and he looked around fearfully, but everywhere the people were busy. No one was looking. He picked up the arrow and put it under his robe. Then there rose a terrible sound. All the animals howled and growled and rushed toward him, but the chief Wolf got to him first, and holding up his hand said, "Wait. He is young and not yet of good sense. We will let him go this time." They did nothing to him. When night came some one shouted out, calling people to a feast and saying, "Listen, listen, Wolf, you are to eat; enter with your friend." "We are invited," said the chief Wolf to his new friend, and together they went to the lodge from which the call came. Within the lodge the fire burned brightly, and seated around it were many men, the old and wise of the Raven band. On the lodge lining, hanging behind the seats, were the paintings of many great deeds. Food was placed before the guests�pemican and berries and dried back fat�and after they had eaten the pipe was lighted and passed around the circle. Then the Raven chief spoke and said, "Now, Wolf, I am going to give our new friend a present. What do you think of that?" "It shall be as you say," replied the Wolf; "our new friend will be glad." From a long parfleche sack the Raven chief took a slender stick, beautifully ornamented with many-colored feathers. To the end of the stick was tied the skin of a raven�head, wings, feet, and tail. "We," said the Raven chief, "are those who carry the raven (Mas-to-pah'-ta-kiks). Of all the fliers, of all the birds, what one is so smart as the raven? None. The raven's eyes are sharp, his wings are strong. He is a great hunter and never hungry. Far off on the prairie he sees his food, or if it is deep hidden in the forest it does not escape him. This is our song and our dance." When he had finished singing and dancing he placed the stick in the sack and gave it to the man and said, "Take it with you, and when you have returned to your people you shall say, 'Now there are already the Bulls, and he who is the Raven chief said, "There shall be more. There shall be the All Friends (Ikun-uh'-kah-tsi), so that the people may live, and of the All Friends shall be the Raven Bearers."' You shall call a council of the chiefs and wise old men, and they shall choose the persons who are to belong to the society. Teach them the song and the dance, and give them the medicine. It shall be theirs forever." Soon they heard another person shouting out the feast call, and, going, they entered the lodge of the chief of the Kit-Foxes (Sin'-o-pah). Here, too, old men had gathered. After they had eaten of the food set before them, the chief said, "Those among whom you have just come are generous. They do not look carefully at the things they have, but give to the stranger and pity the poor. The kit-fox is a little animal, but what one is smarter? None. His hair is like the dead grass of the prairie; his eyes are keen; his feet make no noise when he walks; his brain is cunning. His ears receive the far-off sound. Here is our medicine. Take it." He gave the man the stick. It was long, crooked at one end, wound with fur, and tied here and there with eagle feathers. At the end was a kit-fox skin. Again the chief spoke and said, "Listen to our song. Do not forget it, and the dance, too, you must remember. When you reach home teach them to the people." He sang and danced. Then presently his guests departed. "What is your opinion, friend Wolf? Shall we give our new friend a present?" "It shall be as you say," replied the Wolf. "It is yours to give." Then spoke the Bear, saying, "There are many animals and some of them are powerful; but the bear is the strongest and greatest of all. He fears nothing and is always ready to fight." Then he put on a necklace of bear claws, a band of bear fur about his head, and a belt of bear fur, and sang and danced. When he had finished he gave the things he had worn to the man and said, "Teach the people our song and our dance, and give them this medicine. It is powerful." It was very late. The Seven Stars had come to the middle of the night, yet again they heard the feast shout from the far end of the camp. In this lodge the men were painted with streaks of red, and their hair was all pushed to one side. After the feast the chief said, "We are different from all others here. We are called the Braves (Mut'-siks). We know not fear; we are death. Even if our enemies are as many as the grass we do not turn away, but fight and conquer. Bows are good weapons, lances are better; but our weapon is the knife." Then the chief sang and danced, and after-ward he gave the Wolf chief's friend the medicine. It was a long knife and many scalps were tied on the handle. "This," said he, "is for the All Friends." To one more lodge they were called that night and the lodge owner taught the man his song and dance, and gave him his medicine. Then the Wolf chief and his friend went home and slept. Early next day the Blackfeet women began to take down the lodge and to get ready to move their camp. Many women came and made them presents of food, dried meat, pemican, and berries. They were given so much that they could not take it all with them. It was long before they joined the main camp, for it had moved south, looking for buffalo. When they reached the camp, as soon as the lodge was pitched, the man called all the chiefs to come and feast with him, and told them what he had seen, and showed them the different medicines. 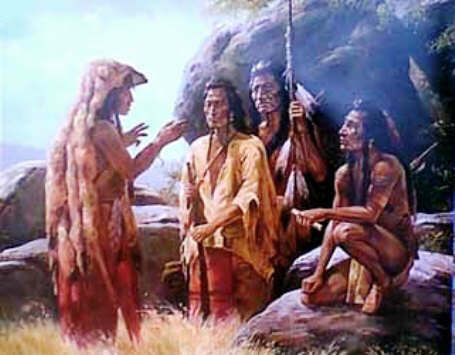 Then the chiefs chose certain young men to belong to the different societies, and this man taught them the songs and dances, and gave its medicine to each society.